One thing that is hard to keep up with are the thousands of youth titles that are published every year. But, it's important to stay current and relevant. So, we're listing some good titles that have been recently published that you might want to pick up and check out. Here are 5 that just might knock your socks off! Click on the link to see the book covers! Son by Lois Lowry--That's right! Lowry has finally provided the "satisfying" ending that we've all been waiting for since the publication of The Giver. Available in hard copy and on Nook. Little Dog, Lost by Marion Dane Bauer---A boy filled with longing and a small dog, left behind, find each other in this complex tale of loss, need, and desire. A novel in verse for grades 3-5. Available in hard copy. Ladybugs by Gail Gibbons---A nonfiction piece that covers the lifespan of the ladybug. You're bound to learn something you didn't know. And, Gibbons has provided a work that is packed with her trademark illustrations ONLY this time you won't be overwhelmed with information overload. So, this one is safe to share with even your youngest readers! Available in hard copy. More by I.C. Springman---A picture book that is perfect for the earliest of readers and a GREAT way to talk about consumerism/need/sustainability with the youngest readers. A magpie who can't stop collecting items gets a little help from his friend, Mouse, when it all becomes too much. Available in hard copy. Quarantine by Lex Thomas---Remember when you had to read Lord of the Flies? Well, here's a modern take on it. Brothers, David and Will, along with a whole high school of students struggle for survival when a deadly virus breaks out. Halloween...Kids love it! And, so do we. 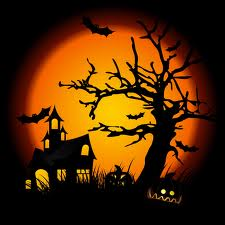 Stop by and check out the awesome Halloween books that are on display behind the service desk. And, yes, you can check them out! The Presidential Election is just around the corner. So, we have pulled some books for you! Fiction and nonfiction of various reading and interest levels have been moved to a blue box. Please feel free to grab them and check them out at the circ. desk! Over 20 rejections later, A Wrinkle in Time was published in 1962 by Farrar, Straus, Giroux. It would go on to win the 1963 Newbery Medal and the hearts of millions of fans. In honor of its 50th Anniversary, Farrar, Straus, Giroux has released a special anniversary edition of the book. Not only that, but Hope Larson was chosen to create the graphic novel adaptation which was released on October 2! Come in and revisit the still relevant and very poignant work of Madeleine L'Engle! 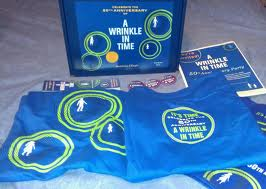 Win a Wrinkle in Time 50th Anniversary Gift Bag Filled with Goodies! This book is a classic tale of good vs. evil. Meg Murry, Charles Murry, and Calvin O’Keefe go in search of the Murrys’ father, a government scientist, who has mysteriously disappeared after working on a project called a Tesseract. First published in 1962, a recipient of the 1963 Newbery Medal, this book has impacted lives the world over. And, still is impacting them today! Pick up a copy of A Wrinkle in Time and revisit it. Or, if you haven’t read it---YOU SHOULD! What are you waiting for? Find out what happens on that dark and stormy night! 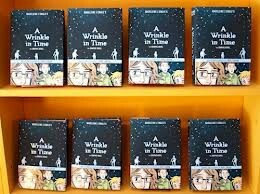 Register to win a Wrinkle in Time 50th Anniversary Gift Set that includes a tote bag, bookmark, button, tee-shirt, poster, a paperback anniversary edition of A Wrinkle in Time, and a copy of Hope Larson's graphic novel adaptation! Wow--what a haul! Good Luck! Drawing will take place on November 1, 2012! We have leveled nonfiction? They have neon green stickers on them for easy browsing. We have a collaborative workstation with a widescreen tv? It is available to users at any time, no log-on necessary. New books are put on the new books table every Monday morning? Be sure to check it out! We have faculty rolling carts? If you've checked out more books than you can carry, then also check out a rolling cart so you can easily transport your books from the library to your building. Congratulations to Angela Hayes, winner of the Coretta Scott King 2012 Award Winner Underground by Shane Evans!! !